Studies show millennial women have enormous power—when it comes to spending, that is. But what about when it comes to building wealth, like saving and investing toward the future? 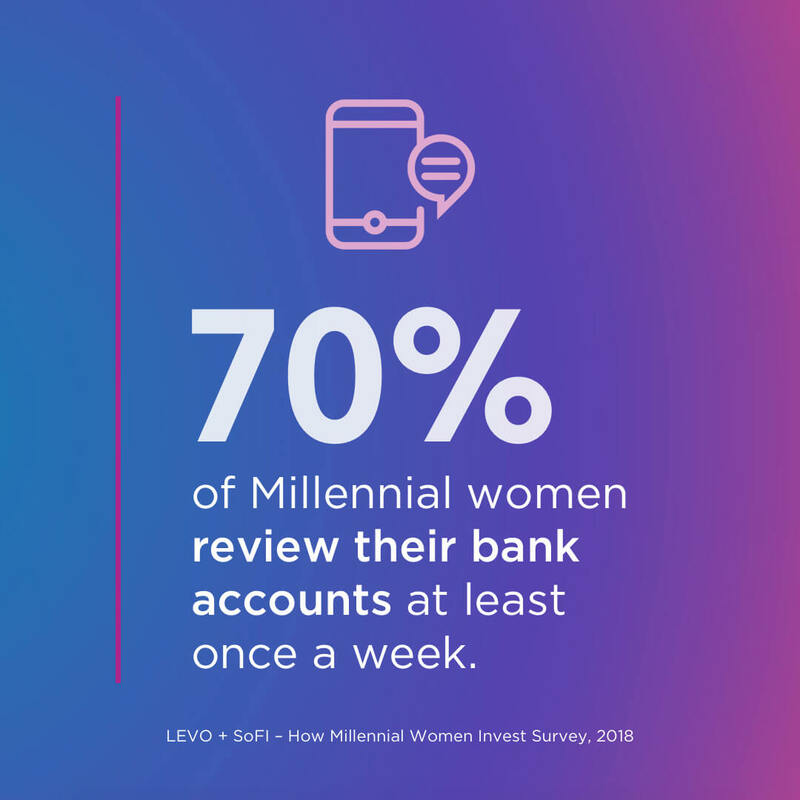 To figure that out, SoFi teamed up with Levo to survey 2,050 millennial women on their behaviors and motivations around financial habits, with intriguing results. Millennials get a bad rap when it comes to personal finance. They’re often labeled as unprepared for the future or emergencies because they don’t save enough, if anything at all. However, of the women surveyed, 53% have an emergency savings fund set aside (covering three to six-plus months of housing and necessities). And they don’t just keep their money under the bed: 70% review their bank accounts at least once a week. 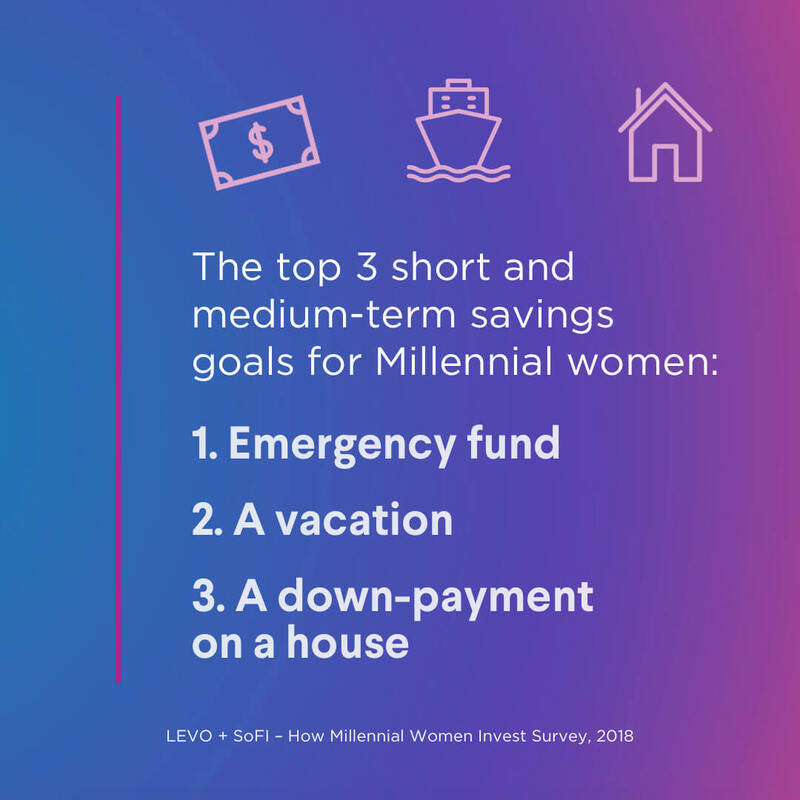 These findings indicate millennial women are much more financially responsible than they’re given credit for, in that they are savers and have cash flow to invest. What’s interesting is that even though they could invest, they don’t. When asked why, 56% say fear holds them back, even if they’re interested in getting started. The unfortunate part about that is, women are making more money than ever before, but are still behind when it comes to investing and financial planning. But when they do get in the investing game, they’re actually good at it: Studies show that when women invest, they often outperform men. Unsurprisingly, even women who are ready to invest their money are still held back by student debt. 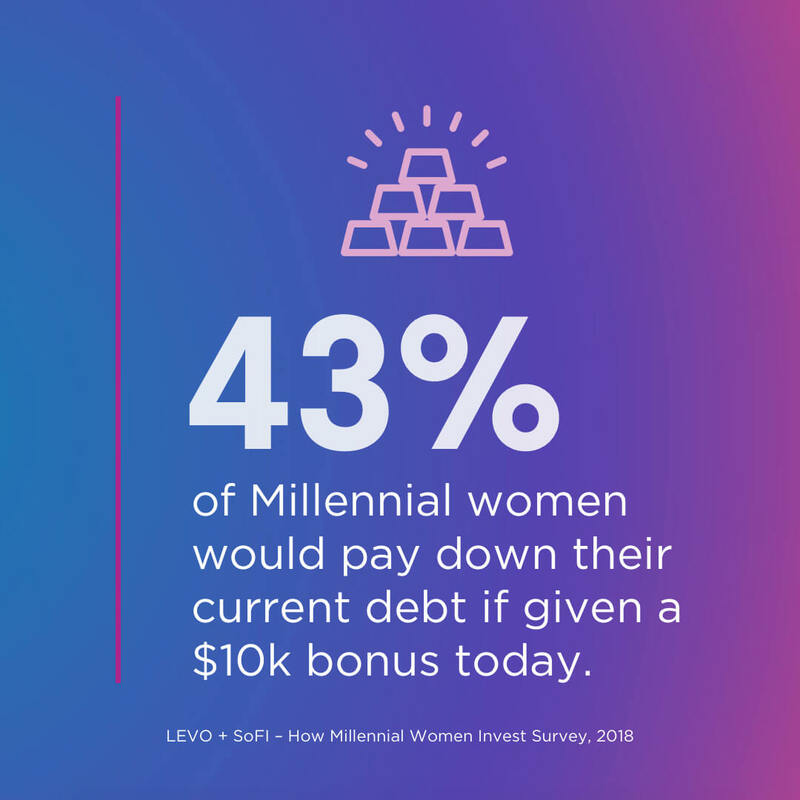 Of those surveyed, 43% said they would pay down their current debt faster if they were given a $10,000 bonus today (rather than saving or investing it). And that instinct to pay down debt first pays off, literally: A separate analysis of SoFi data found that despite the fact that women have as much student debt and make less money than men, they pay their student debt off more quickly—nearly 4 months ahead of men. Millennial women who are investing do so with several end goals in mind. 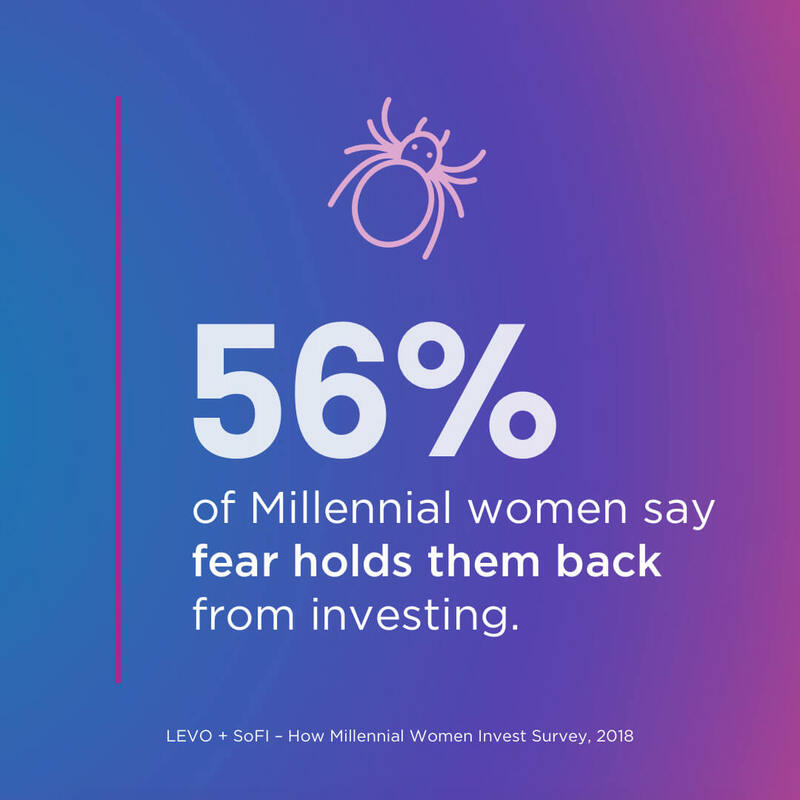 The top investment goal cited on the Levo survey was “stability and security for the future,” which is a common one. But in second came a goal with a more millennial flair—to build wealth to “have more choices [to] pursue my passions,” or to live to work rather than work to live. As for short and medium-term goals, they are currently saving for an emergency or rainy-day fund first, followed by a vacation and a down-payment on a house. In short, women are saving up and interested in investing, but are unfortunately held back by fear. They’re smart about paying off debt first—and when they do invest, the record shows that they set themselves up for an even brighter future. SoFi Lending Corp. is licensed by the Department of Business Oversight under the California Financing Law, license number 6054612. SoFi loans are originated by SoFi Lending Corp., NMLS # 1121636. Advisory services are offered through SoFi Wealth, LLC. INVESTMENTS: NOT FDIC INSURED • HAVE NO GUARANTEE • MAY LOSE VALUE.